Halina lives near Zywiec, in the south of Poland. 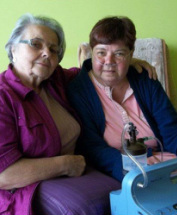 She was in desperate need of an oxygen concentrator, to help her breathe. When Cycle Poland 2012 popped in, the concentrator we brought was whisked away to Halina - who was able to enjoy the relief it brought that very day.